After designer Anamika Khanna’s Grand Finale show at the Dr. Bhau Daji Lad Museum was disrupted by the Sena workers in March this year, I thought the organizers of Lakme Fashion Week will never ever venture anywhere near the heritage museum. But I have been proven wrong. At the forthcoming Lakme Fashion Week, Winter/Festive 2015 they are having a ‘Reinvent Benaras’ at Dr. Bhau Daji Lad Museum on the Handloom and Textile Day on 27th of August. But this time nothing will go wrong as the event is curated by none other than the BJP Spokeswoman and designer, Shaina NC. Shaina won’t be haunted by Sena or any such moral police as she is from the ruling party. In fact Shaina NC, who I thought was famous only for zillion ways of draping saris and Parsi embroidery has virtually become the all-important ‘Benarasi Ambassador’. Being a BJP spokesperson matters. The new government’s textile policy is anti handloom and pro power loom yet none of the ruling party members miss the opportunity of doing lip-service for Weavers of Benaras because our loving PM – Narendra Modi is the MP from Varanasi. The plight of the weavers hasn’t changed a bit but many have benefitted from lavish government funding by doing ‘Benarasi’ themed shows. Everybody is stuck upon Benarasi these days. 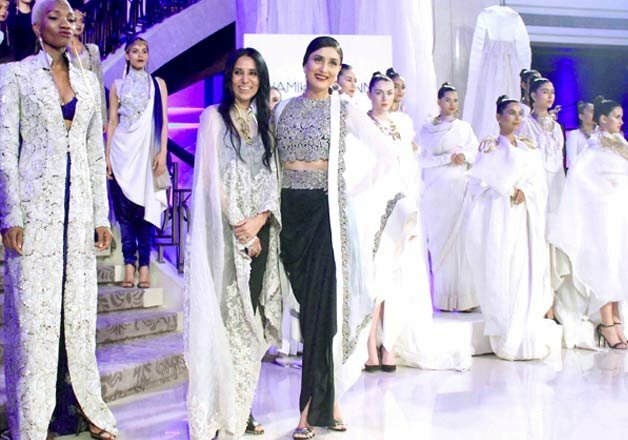 The Abu Jani and Sandeep Koshla’s show at the Bridal Fashion Week is based on Varanasi. Previous Previous post: Are You A ‘GOOD’ Indian Or A ‘BAD’ Indian? Shaina NC may position herself as someone who cares for karigars, but the reality is that she is most commercially inclined and cares little for the causes she espouses– cancer society included. I have to say that is one underwhelming museum exhibit! On every name tag of every outfit or look bearing the designer’s name, it also reads ‘curated by Shaina N C’. Makes you wonder if Ms. N C is so passionate about Benarasis, then how come she didn’t have one outfit to contribute from Golden Thimble? So it’s a good branding exercise, to have your name displayed everywhere against the real contributors, in bold font lest one forgets! With all her good intentions, NC is in the throes of power play..Nice to make hay while the sun shines, but nothing lasts forever. And I heard this– at Ritu Kumar’s show (again curated by Shaina NC) at LFW the weavers walked the ramp– and a big noise was being made about how ‘weavers’ are now in the limelight. Heard this through a most reliable source– the 4 or 5 ‘weavers’ who took a bow, were NOT weavers, they were traders or middlemen who act as a go-between the weavers and stores/ companies.